Like the national capitol, the Texas state capitol was once considered the “people’s house.” It used to be open almost all the time, with limited security. Security has been tightened in recent years, but the Texas state capitol still welcomes the public year-round. The easiest way to view the building is to pick up a brochure on the first floor and take a self-guided tour. However, you’ll get more out of the visit with the help of a knowledgeable tour guide. Guided tours start every 15 minutes in the south foyer and last about 40 minutes. 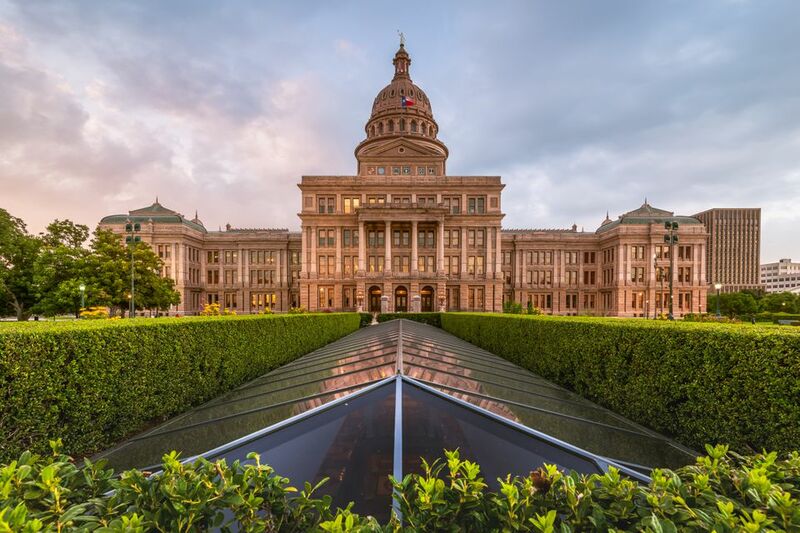 Normal business hours are Monday through Friday 8:30 a.m. to 4:30 p.m.; Saturday 9:30 a.m. to 3:30 p.m.; and Sunday noon to 3:30 p.m. A typical tour covers the building’s architecture, state history and fun facts about the Texas Legislature. The guided tour will help you spot some of the less obvious details of the building, such as door hinges with “Texas Capitol” engraved into them. Similar attention to detail can be seen in the doorknobs and in the floor tiles. For those interested in the “wow factor,” there are also sweeping staircases and glittery chandeliers. On weekdays, a special Women in Texas History tour is offered at 11:15 a.m., and a Heroes of the Texas Revolution tour begins at 2:15 p.m. Nature buffs may also want to pick up the Trail of Trees brochure. It highlights the history of the capitol’s well-manicured grounds, with a particular focus on the majestic oak, southern magnolia and bald cypress trees. In total, there are 25 different tree species on the capitol grounds. Located at 112 East 11th Street, the Capitol Visitors Center houses exhibits related to the history of the capitol and the state as a whole. Larger group tours of the capitol, such as school field trips, can also be arranged here. The Capitol Visitors Parking Garage is located at 1201 San Jacinto Boulevard. You can enter from East 12th Street or East 13th Street. The first two hours are free, and each additional half hour costs $1; the maximum charge is $12. Keep in mind that you'll be exiting onto San Jacinto Boulevard, which is a one-way street heading south. · The design of the capitol building was decided via a nationwide competition. Architect Elijah E. Myers, who also designed the capitols in Colorado and Michigan, won the competition. The contractors on the project were granted 3 million acres of land, which later became the famous XIT ranch in the Panhandle. · Controversy haunted the building’s construction from the beginning. The pink granite was donated by the owners of a quarry in Marble Falls. However, to save money, the state decided to use convicts to quarry the notoriously hard rock. When local granite cutters boycotted the project due to the use of convict labor, the state brought in workers from Scotland to replace them. · In 1993, a sprawling underground capitol extension opened. Essentially, the capitol outgrew its above-ground space and had to start building downward. The 600,000-square-foot four-level structure includes offices for Senators and House Representatives, parking, a bookstore, cafeteria and auditorium. The design features skylights that let in a remarkable amount of natural light. · Texas’ first permanent capitol was completed in 1853, but the Greek Revival building burned to the ground in 1881. · In the south foyer, life-sized statues of Sam Houston and Stephen F. Austin stand guard over the entryway. A huge painting in the foyer by William Henry Huddle depicts a major turning point in Texas History: the surrender of Mexican General Santa Anna. Tiles in the terrazzo floor depict 12 major battles fought in Texas. · One of the oldest outdoor exhibits is the Heroes of the Alamo, built in 1891. The gazebo-shaped structure displays battle scenes. The names of the people who fought and died at the Alamo are engraved into the granite. The Alamo itself is also a worthwhile stop if you’re in the region for several days. · Try clapping your hands while standing under the capitol rotunda and listen as the sound echoes throughout the massive structure. · In the senate chamber, many of the original desks, made of walnut, are still in use. They’ve been modified slightly to accommodate modern technology. · In a sign of how important agriculture was to the state in its early days, an Agricultural Museum was created within the capitol soon after the building was completed. In addition to displaying information about some of the state’s early food crops, the room is chock full of antiques from the 1800s and early 1900s. The capitol’s site in the heart of downtown Austin means that several restaurants, in every price range, are within walking distance. Another historic building, the Paramount Theatre, is three blocks south of the capitol on Congress Avenue. It hosts red-carpet movie premieres, plays, stand-up comedy and concerts.